I'm Sittin' High on a Hill Top From the 20th Century-Fox Production Thanks a Million. Lyric by Gus Kahn, Arranged by Ed Smalle, and Melody by Arthur Johnston. Modern Quartette Arrangement with Piano Accompaniment. Sheet music is in very good condition, slight wear at edges, music store stamp on front cover. 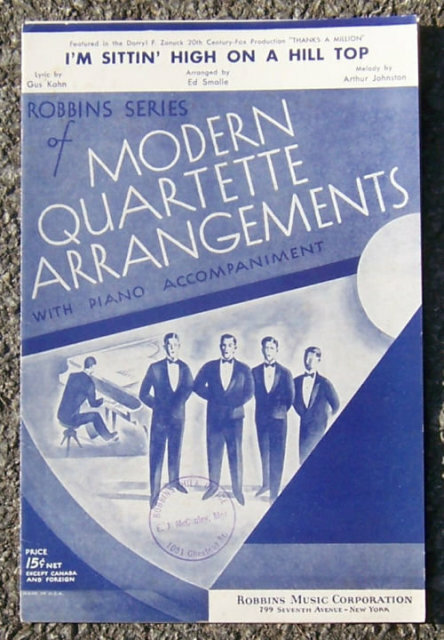 1935 Robbins Music.